Sean Szymkowski February 11, 2019 Comment Now! 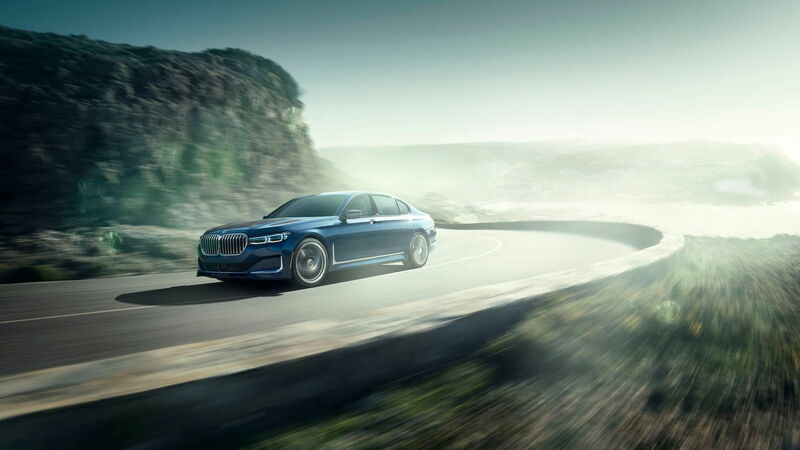 The 2020 Alpina B7 stormed onto the scene in a Monday announcement, and in typical Alpina fashion, the latest B7 looks the part and packs all the essentials of a flagship sport sedan. 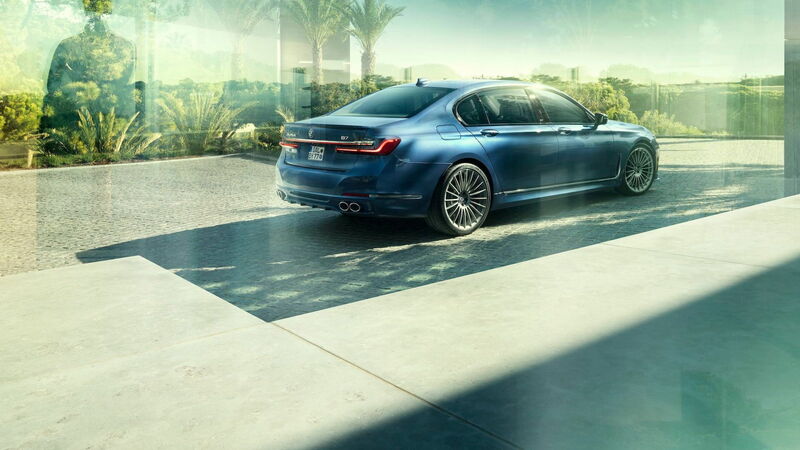 Alpina underscored the B7's smooth operation and door-busting torque delivery. Under the hood is a 4.4-liter twin-turbo V-8 that spools up 600 horsepower and 590 pound-feet of torque. Alpina improved BMW's turbocharger system with larger-diameter impellers, specific intercoolers, and new engine management software. Peak torque comes on between 2,000 rpm and 5,000 rpm, which drivers will absolutely notice, Alpina said. The car's top speed climbs to 205 mph, up from 194 mph for the previous B7, and 0-60 mph flashes by in 3.5 seconds, compared to 3.6 seconds previously. Don't forget this is a whopper of a sedan in size, so those figures are mighty impressive. Alpina also reworked the 8-speed automatic transmission, which now features shorter gear ratios and a total spread of 7.81:1. Alpina said drivers should find relaxed cruising at low speeds, but a transmission capable of flicking off shifts with authority when the driver tips into the throttle. The German tuner also beefed up the torque converter with lock-up clutch and planetary gear to handle the extra torque. 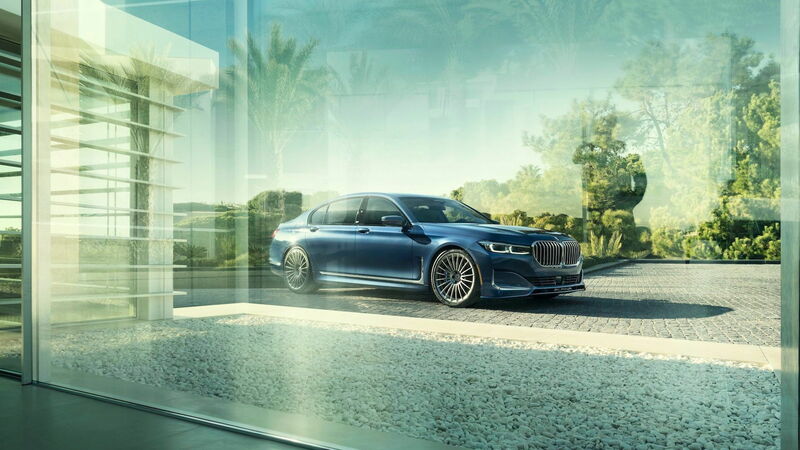 An Alpina sport exhaust system reduces back pressure, lowers the car's final weight, and includes active valves so drivers can choose how much noise the car emits; the Sport mode unleashes the 4.4-liter twin-turbo V-8's full bark. Alpina also massage the suspension. It features numerous BMW features, such as air springs, adjustable adaptive dampers, and Active Comfort Drive with Road Preview (which reads the road ahead to adjust the suspension accordingly). Rear-axle steering is also standard, though Alpina adjusted it to complement its tweaked suspension. The system can turn the rear wheels up to 3 degrees for sharper cornering. The B7's air suspension also lowers the car 0.6 inches in Sport+ mode. Don't want to reach all the way down to that button to change the ride height? Simply reach 140 mph and the car will do it automatically. Drivers can also raise the suspension 0.8 inches to clear pesky driveway entrances or other annoyances. Alpina also recalibrated BMW's xDrive all-wheel-drive system to provide greater agility under lateral acceleration and keep the car better composed and balanced. A set of Michelin performance tires specific to the B7. measuring 255/40ZR20 at the front and 295/35ZR20 at the rear, wrap signature Alpina multi-spoke 20-inch wheels. A set of 21-inch "minimalistic" wheels is optional—ditto for all-season rubber. Under those wheels sit big brakes controlled by wire. They feature 15.5-inch rotors up front with 4-piston calipers and 15.7-inch rotors in the back with sliding calipers. 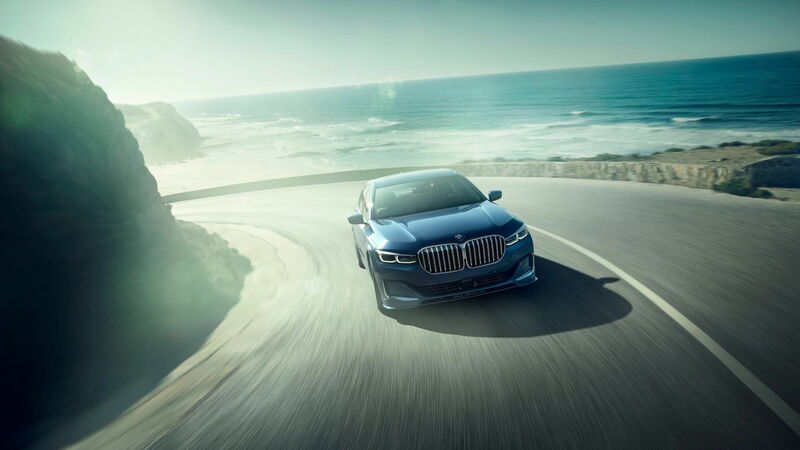 The Alpina B7, somehow, manages to embrace the 2020 7-Series' massive grille for the better. It may seem overwrought on the standard 7-Series, but it looks right at home with the B7's oversized wheels and new front bumper with functional air intakes. It probably helps the car is finished in Alpina Blue Metallic, which looks stunning in the photos. Alpina Green Metallic is also available, as is a palette of BMW exterior color choices. The B7 isn't only about performance. Occupants are treated to a comfort-packed cabin. Nappa leather coddles passengers and the latest infotainment and digital improvements to the regular 7-Series translate to the B7. Specifically, the B7 gets the new digital gauge cluster with its revised speedometer and tachometer. Alpina also finishes the steering wheel with Lavalina leather and blue and green stitching. Buyers can choose between Piano Black or Myrtle Luxury Wood interior trim, and they can add Alpina B7 model inscriptions. Safety is also on the docket. The B7 comes standard with forward-collision warnings with automatic emergency braking and pedestrian and bicyclist detection, lane-departure warnings, blind-spot monitors, and rear cross-traffic alerts. Safety options include adaptive cruise control, active lane control, an automatic lane change feature, and BMW's semi-autonomous Extended Traffic Jam Assistant, which allows for hands-free driving at speeds up to 37 mph if the driver is paying attention. The performance and luxury comes with a price to match. Alpina will charge $142,695 which includes a $995 destination fee, for a new B7 sedan when it goes on sale this fall. For now, it has the right stuff to mimic a proper M7. BMW might have its own plans for a stately sport sedan, though, for the first time in its history.